Welcome to Today@WKU, the daily newsletter from WKU Public Affairs, for December 14, 2018. 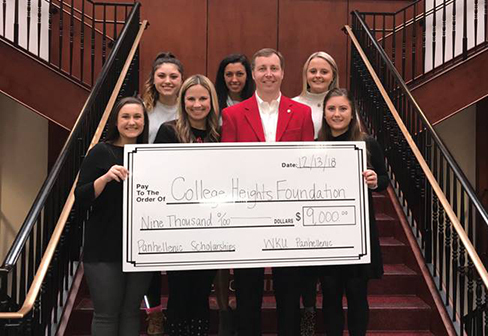 WKU Panhellenic Council makes gift to enhance Greek scholarships: WKU’s Panhellenic Council recently voted to make additional gifts to their three scholarship funds: United in Sisterhood Scholarship for Greek Women, Panhellenic New Member Academic Scholarship and the Panhellenic Association Pillars Scholarship Fund. This gesture comes a year after the Council made a contribution to help these funds reach endowment level so each scholarship could begin supporting students. WKU Business Plan Competition Finalists Announced: The WKU Center for Entrepreneurship & Innovation of the Gordon Ford College of Business awarded $3,250 to seven student teams that participated in the annual WKU Business Plan Competition. WKU Staff Council Announces Staff Leadership Institute Class of 2019: The WKU Staff Council’s Staff Leadership Institute (SLI) Committee has selected the SLI Class of 2019. Through a competitive process, the committee selected 21 WKU staff members to participate in the eight-month program, which develops leadership skills for a cohort of WKU staff who has demonstrated advancement potential. Board of Regents to hold quarterly meeting today: The WKU Board of Regents will hold its fourth quarterly meeting at noon today (Dec. 14) in the Martin Regents Room of Jody Richards Hall. Athletics: Hilltopper Student-Athletes Set For Winter Graduation With High Academic Marks: Twenty-two WKU student-athletes, sporting a cumulative grade point average of 3.22, are expected to participate in college recognition ceremonies and receive their degrees from WKU on Saturday. BG OnStage to perform musical adaptation of 'Elf': The only public performance of the show is scheduled for 6:30 p.m. Friday at Van Meter Hall at WKU, according to bgonstage.org. Congress passes farm bill; what that could mean for Kentucky farmers: WKU Agriculture Professor Todd Willian says they've been part of experimental programs with industrial hemp for five years.